Despite bringing prosperity, industrialisation generally leads to increasing levels of pollution which has a detrimental impact on the environment. In response, legislation which seeks to control or prevent such impact has become common. Similarly, climate change and energy security have become major drivers for the regulatory regimes that have emerged in the energy field. Given the global or regional scope of many environmental problems, international cooperation is often necessary to ensure such legislation is effective. The EU and the UK have contributed to the development of the environmental and energy law regimes currently in force, spanning across international, transnational and national levels. At the same time, practical responses to environmental and energy problems have largely been the focus of engineers, scientists and other technical experts. Environmental & Energy Law attempts to bridge the knowledge gap between legal developments designed to achieve environmental and/or energy-related objectives and the practical, scientific and technical considerations applicable to the same environmental problems. In particular, it attempts to convey a broad range of topical issues in environmental and energy law, from climate and energy regulation, technology innovation and transfer, to pollution control, environmental governance and enforcement. In addition the book outlines key sector specific legal regimes (including water, waste and air quality management), focusing on issues or topics that are particularly relevant to both environmental and energy lawyers, and engineering, science and technology-oriented professionals and students. In this vein, the book guides the reader on some basic practical applications of the law within scientific, engineering and other practical settings. The book will be useful to all those working or studying in the environmental or energy arena, including law students, legal professionals, engineering and science students and professionals. By adopting a multi-disciplinary approach to environmental and energy law, the book embraces all readerships and helps to address the often thorny problem of communication between scientists, engineers, lawyers and policy-makers. Karen E. Makuch is lecturer in environmental law and energy law in the Centre for Environmental Policy at Imperial College London, where she teaches postgraduate courses on Environmental Analysis & Assessment, Pollution Management and Global Environmental Change & Policy. She has a wide-range of experience in the practical application of EU Environmental Law and its implementation, including in new and potential EU Member States. Ricardo Pereira (LLM, Ph.D.) is Lecturer in Environmental & Energy Law in the Centre for Environmental Policy, Imperial College London. He also convenes and lectures in the LLM in Environmental Law in the Law School at Queen Mary, University of London, on International Natural Resources Law and the International Law of the Sea. "The fact that this book is not simply aimed at legal experts in no way detracts from the value of its contents, since the authors are all profoundly knowledgeable about the topics in question. An added benefit is that, notwithstanding the complex topic of the study, it is easy to read and highly educational, especially to non-legal specialists, and provides a strong blend of depth and simplicity. This book accordingly merits praise not only for its design, aim and objectives, but also, and in equal measure, for its form and content." 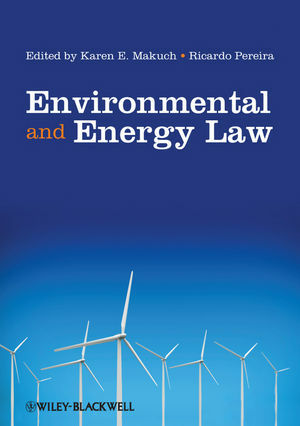 In addition to lawyers and law academics, the book is accessible to engineers and scientists who cover aspects of environmental and energy law in their work or as part of their research and studies. Has a summary of every chapter’s content. Written by authors who are expert in law, social sciences or technology and engineering.